In the opening pages of his recent book on American silent film photography, Still, David S. Shields estimates that over eighty percent of the silent features produced within the first three decades of filmmaking in this country have been lost. Whether through neglect, ignorance, or the ravages of time and deteriorating film stock, a great deal of the motion pictures which formed the foundation of modern-day Hollywood are now gone, becoming mere footnotes in history. Some are remembered solely through anecdotes or reminiscences from those who saw or participated in the productions. But a select few of these lost movies live on, in part, through still photographs and star portraits taken during the filming of those pictures. The genesis of those still photographs and the photographers who turned the concept into an art form are the focus of Still. 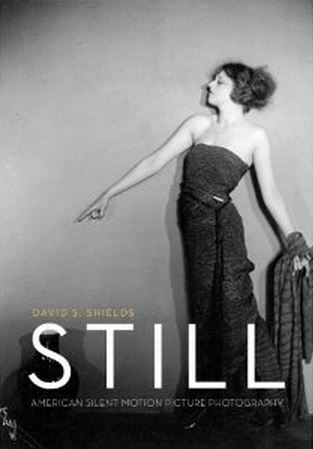 In an exhaustively-researched tome (touted as the first history of the medium of silent film photography), Shields examines not only the important “still men” who planted the roots of film photography itself, but the constructs that arose from their work: namely, the idea of “glamour” and the rise of the “star” through the Hollywood publicity machine’s appropriation of movie images and portraiture. Both the mechanics of silent film photography and the creative forces behind the images are addressed within Still, with individual chapters and sections devoted to some of the most talented photographers to emerge from the period, among them James E. Woodbury (collaborator with D.W. Griffith); Jack Freulich (closely associated with Universal); Arthur Rice (who spent his brief career at Metro, one of the studios that would be enfolded into MGM in 1924); and M.I. Boris (the go-to still photographer for Paramount). Interestingly, Shields also devotes an entire chapter to Lillian Gish, whom he credits as possessing “the acutest eye for camera talent of any cinematic performer of the era,” for not only was Gish a gifted performer, but she was adept at finding talented photographers to work on her films. Gish championed a number of notable artists, beginning in 1919 with James Abbe and continuing with her collaborations with Charles Albin, Kenneth Alexander, Henry Waxman, and Milton Brown, all of whom produced iconic images of the actress in some of her most famous silent-era roles. Though the book includes a wealth of lovely photos, if you’re looking for a mere glossy photographic brick to adorn your coffee table, you’d be best served to look elsewhere. No simple picture book, Still instead serves as an in-depth reference guide to the history of an art form. While admittedly Shields’ prose sometimes lapses into the overly didactic (in the author’s defense, he is an academic, and he’s produced a suitably academic text), Still remains an entertaining and thoroughly intriguing anthology of the artists who captured the early movies in photographs, complete with some breathtakingly gorgeous examples of their craft. True Classics thanks The University of Chicago Press for sending us a copy of Still for the purposes of this review. This is a shocking statement: “…eighty percent of the silent features produced within the first three decades of filmmaking in this country have been lost.” I had no idea! “Still” sounds like a marvelous book to add to one’s Hollywood reading collection. I’d never heard of it if you hadn’t reviewed it. Thanks!